What is color moiré? If you’ve ever taken a photo of your computer screen with a digital camera, you’ve likely seen moiré. Color moiré is an artificial color banding that can appear in images with repetitive patterns of high spatial frequencies, like fabrics or picket fences – or your computer screen. Color moiré is the result of aliasing (image energy above the Nyquist frequency) in image sensors that employ Bayer color filter arrays, as explained here. It is affected by lens sharpness, the sensor’s anti-aliasing (lowpass) filter (which softens the image), and demosaicing software. It tends to be worst with the sharpest lenses. Color moiré : photographing denim. Color moiré is just one type of moiré. The essence of the moiré is the perception of a distinctly different third pattern which is caused by inexact superimposition of two similar patterns and can be found in applications beyond photography. 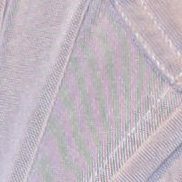 The term moiré has its origins in French: moire, or “watered textile”, is made by pressing two layers of the textile when wet. The imperfect spacing of the threads creates a third pattern from the two layers of fabric which remains after the fabric dries. Color moiré is measured by Log Frequency, which uses a sine chart of logarithmically increasing spatial frequency and by Wedge, which uses wedges found in old and new ISO 12233 charts.